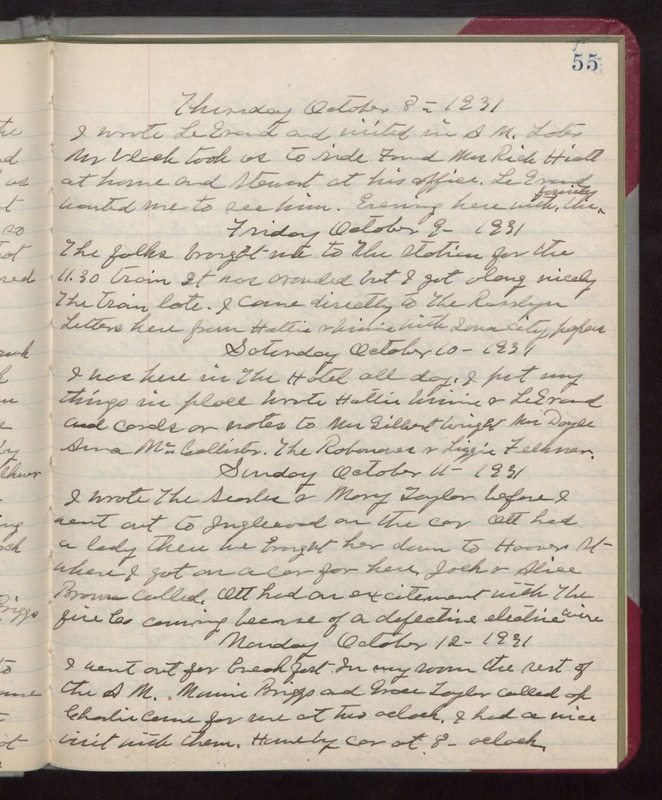 Thursday October 8- 1931 I wrote Le Grand and visited in AM. Later Mr Vlock took us to ride Found Mrs Rick Hiatt at home and Stewart at his office. Le Grand wanted me to see him. Evening here with the family Friday October 9- 1931 The folks brought me to The Station for the 11.30 train It was crowded but I got along nicely The train late. I came directly to The Rosslyn Letters here from Hattie & Winnie with Iowa City papers Saturday October 10- 1931 I was here in The Hotel all day. I put my things in place Wrote Hattie Winnie & Le Grand and cards or notes to Mrs Gilbert Wright Mrs Doyle Anna McCallister, The Robonoves & Lizzie Felkner. Sunday October 11- 1931 I wrote The Searles & Mary Taylor before I went out to Inglewood on the car Ott had a lady there We brought her down to Hoover St where I got on a car for here. Jack & Alice Brown called. Ott had an excitement with The fire Co coming because of a defective electric wire Monday October 12- 1931 I went out for breakfast. In my room the rest of the AM. Marnie Briggs and Grace Taylor called up Charlie came for me at two oclock. I had a nice visit with them. Home by car at 8-oclock.